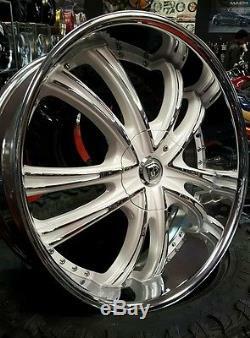 24x9 Lexani LSS-55 6x139.5 6x5.50 +15 , 1 Rim Chrome w white pearl new. 1 Rim , 24x9 Lexani LSS-55 CHROME WITH PEARL WHITE AND CHROME LIP. 24x9 +15 6 lug big 108mm center bore. 6x139.5 or 6x5.50 Chevy Gm Cadillac , some nissan etc. Only have one rim discontinued. This was our display wheel. There are no others please don't ask for this rim in other sizes colors etc.. You can have painted another color if needed. Thank you for your business in advance! Keeps us and you safe! WE are a real tire and rim performance shops. Not just another typical ad with unmanned listing. We are real people who do this daily in our retail shops. The item "24x9 Lexani LSS-55 6x139.5 6x5.50 +15,1 Rim Chrome w white pearl new" is in sale since Wednesday, August 31, 2016. This item is in the category "eBay Motors\Parts & Accessories\Car & Truck Parts\Wheels, Tires & Parts\Wheels". The seller is "wholesalewheelsmore" and is located in Greer, South Carolina. This item can be shipped to United States.